Blessings, Miracles, &Thoughts in Between: Sun Tanned Toes Tickling the Sand!! 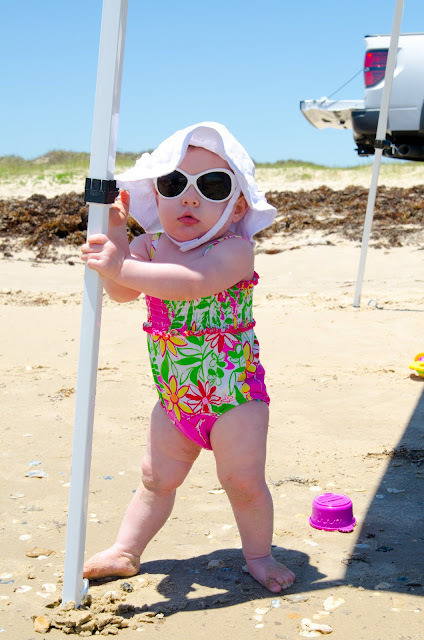 Ok, maybe more like super pasty in desperate need of a pedicure toes, man toes, and sweet little chubby baby toes tickling the sand! Either way, we had a blast yesterday at the beach! I think all three of us needed time away from the city and Matagorda was a wonderful day trip! It is not Destin, and cannot even remotely be compared to Hawaii, but there was sun, sand, a light breeze, warm Gulf water, and cold beer! We couldn't really ask for more! Kate did great! Our drive there was timed perfectly to her morning nap so she slept in the car. She loved the sand as soon as we put her down in it - and only managed to eat a few bites. I was impressed! Kate was apprehensive about the water for all of 5 minutes before she realized it was just a big bath tub and fell in love! 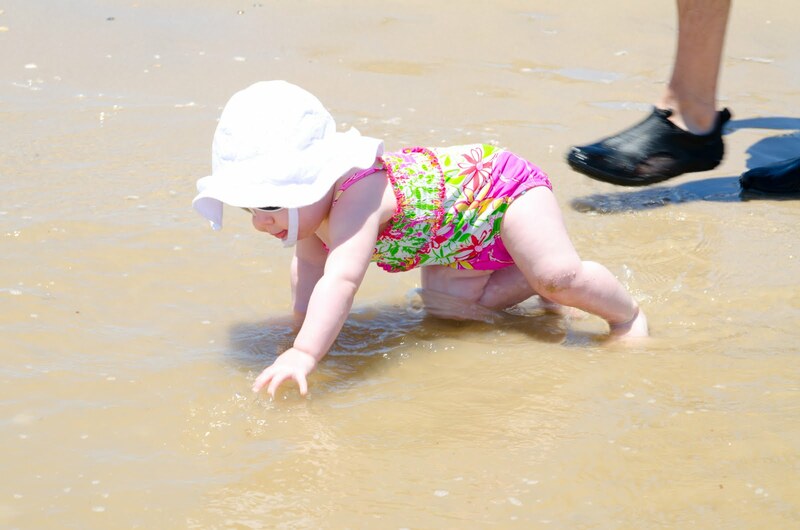 The first time her sweet toes touched the Gulf! Hanging out under the tent for a bit. Alex set up his surf rods but, the seaweed problems we are having on the Texas coast made it impossible to catch anything but gigantic globs of seaweed. Kate loved standing in the water and thought it was too funny when the waves would come in. Alex and I about broke our backs bending over so she could stand up! Hi little beach baby! 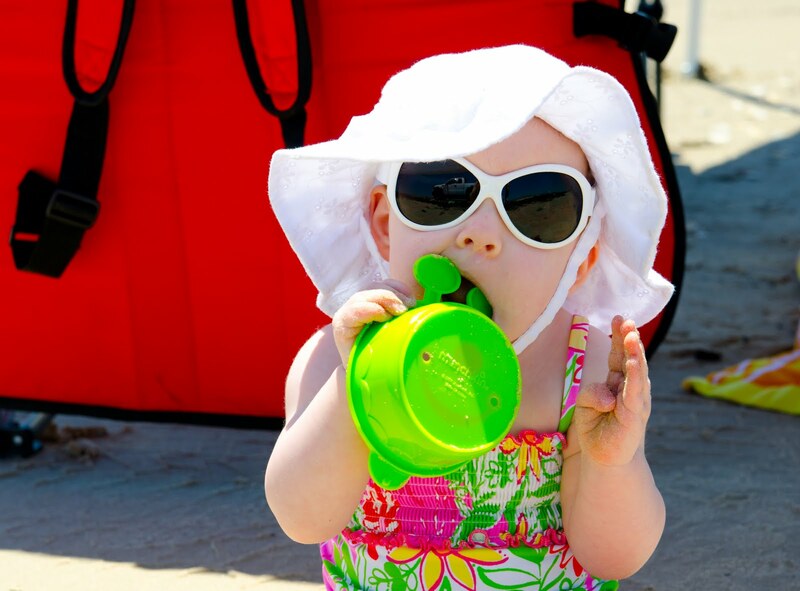 I just can't get over the cuteness of her swimsuit, shades, and hat! 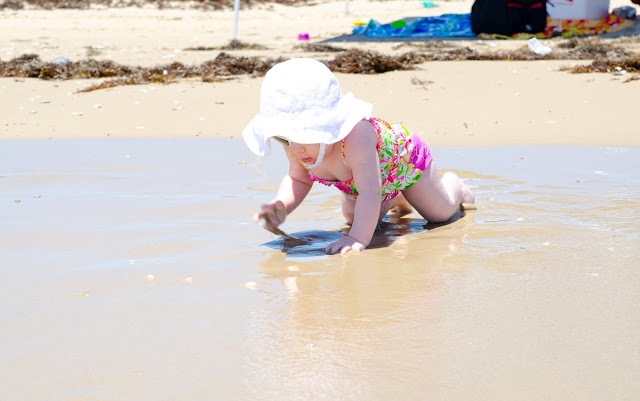 She crawled all over the beach! 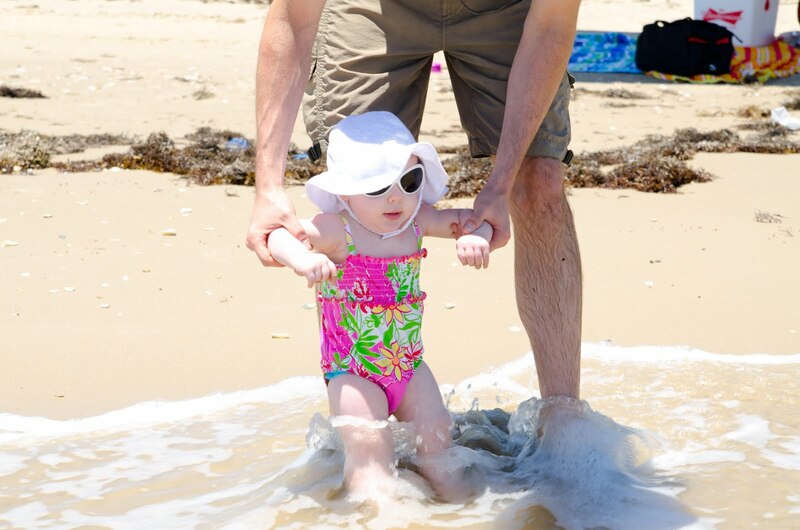 Kate is fearless and kept trying to crawl into the surf. She even tried to go for a swim! We picked up 15 pounds of huge, fresh, yummy Gulf shrimp before heading home! Alex boiled about 5-6 pounds last night and they were amazing!!! I am so glad Kate had such a good time! I was starting to stress out that maybe we booked our Hawaii trip prematurely. I mean, what would we have done if she hated the beach? I'm glad we don't have to worry about that! 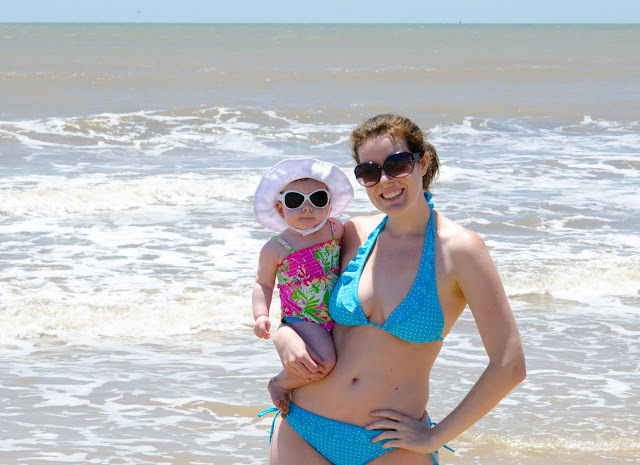 I'm sure we will be heading back to our Texas beaches soon! Absolutely adorable, as always! You're getting so good at the camera and editing. 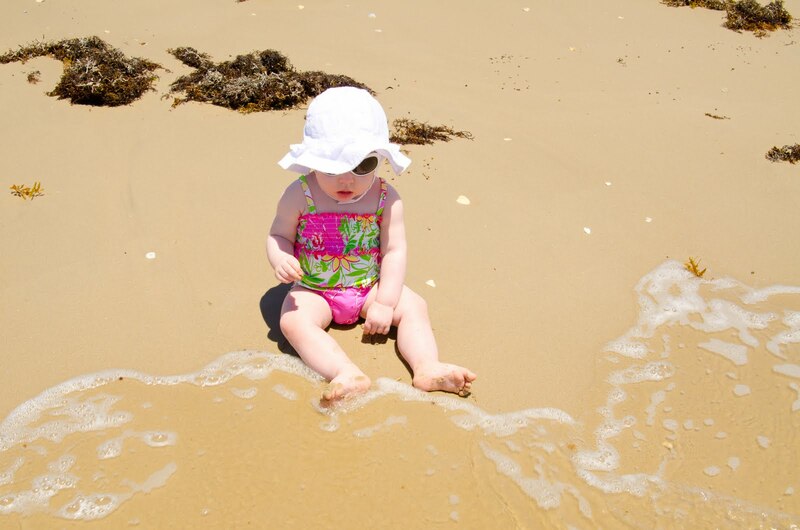 I can't wait to take Lucas to the beach for the first time. 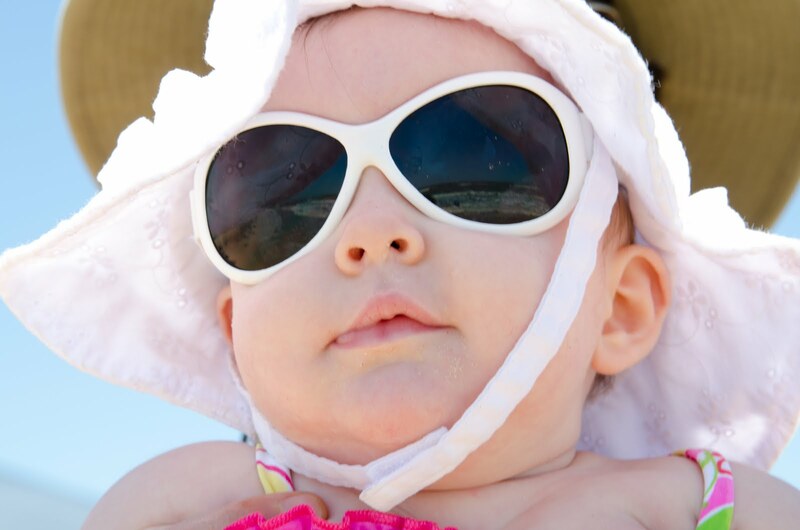 Her sunglasses are adorable! 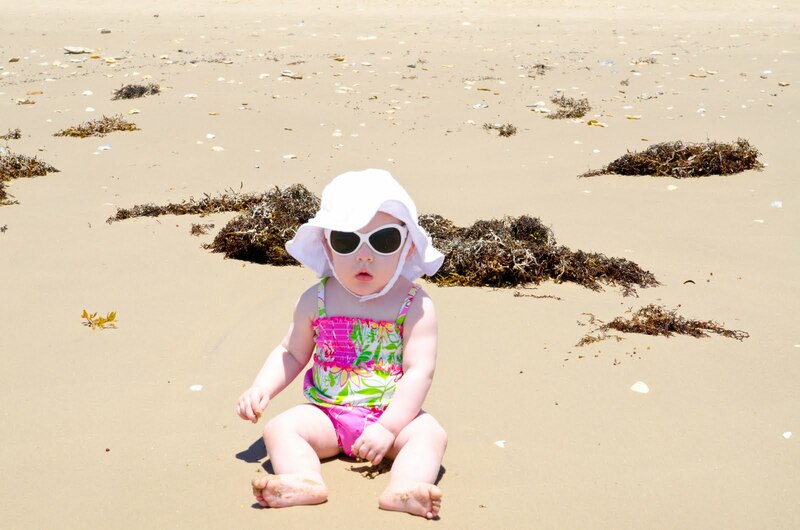 I'm glad she loved the beach - it shows! Precious pictures! 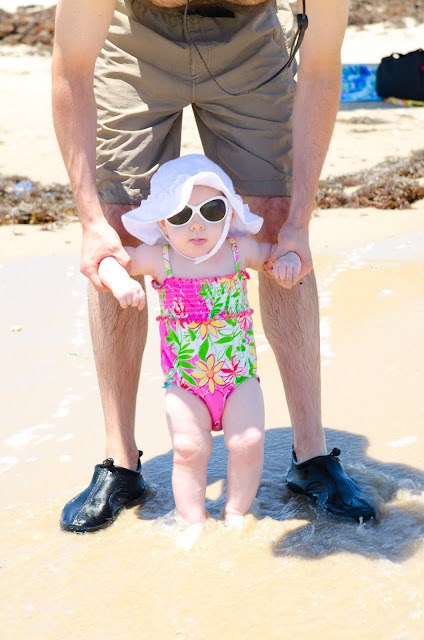 How cute is that swimsuit! 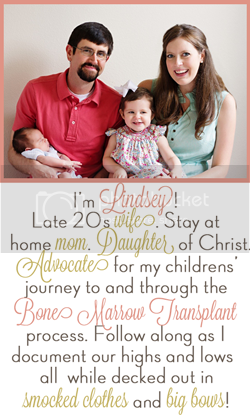 She is going to love Hawaii! She is so cute! I love her swimsuit!!! Looks like so much fun!! Kates shaded are super cute, where did you buy them from? Kates shaded are cute. where did you buy them from? I love her glasses! Where did you get them?? My favorite is the pic of her standing up holding on to the tent. What a big girl! You are looking great, sister! So jealous! Looks like you guys had a great time!